The 2011 Triangle Club Holiday Basketball Tournament ended with a new champion. Norristown had won 6 of the last 7 tournaments. Central Dauphin traveled in from Harrisburg and defeated Norristown 52-48 on December 28th to win the 38th annual boys basketball tournament. If the high school name Central Dauphin sounds familiar it is because they recently defeated North Penn (14-7) in the 4A PIAA state football championship. 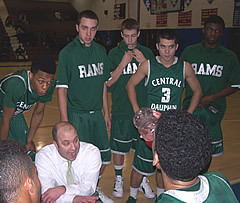 Coach Jay Crosier’s Central Dauphin Ram’s (District 3) have a very formidable basketball team with 3 returning lettermen and three football players on his roster. Crosier wanted some tough early season match ups versus District One teams and he got his wish. On opening night Central Dauphin played the Souderton Indians. Souderton coach Dennis Stanton returned a number of lettermen and is expected to challenge for the Suburban One’s Continental Conference. Many fans were anticipating the match up of two big men, Central Dauphin’s first team all-state 6’8″ Devin Thomas and Souderton’s 6’5″ Ryan Connolly. The match up never took place because Connolly came down with pneumonia and was unable to play. But Connolly’s Souderton team mates were determined. After a slow start and a double digit deficit most of the game, the Indians came charging back in the second half and tied the score at 46-46 in the final minute and send the game into overtime. In overtime the Rams made some key foul shots and Devin Thomas’ (32 points and 20 rebounds) inside presence made the difference. Central Dauphin won 56-52. 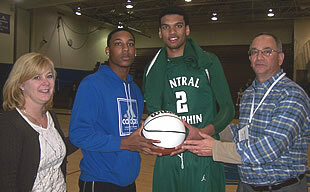 Devin Thomas’ 32 points was one point short of the tournament scoring record of 33 set in 1987 by Ken Coull of Norristown. Central Dauphin 6’2″ senior forward Ryan Beaver drained 3 three point field goals. Souderton’s point guard Luke Moyer scored 21 points and Mark Wonderling added 15 in the losing cause. In the night cap Norristown’s pressure defense forced Murrell Dobbins into many turnovers. Norristown led at halftime 35-21. Norristown coasted to a 62-44 victory behind the balanced scoring of 6’5″ forward Jahbri Hargrove (11 points) and guards Luke Kelley and Samir Bey each scoring 10 points. Curt Lever added two three pointers off the bench. The second night of the 38th annual tournament opened with Souderton running past Dobbins 68-51 in the consolation game. Coach Dennis Stanton felt the tournament gave his Souderton team a boost of confidence for the upcoming league play. 6’8″ sophomore center Brenden Wagner got some valuable playing time in Connolly’s absence. The 2011 championship game saw Central Dauphin jumping out quickly to a 32-19 halftime lead. Norristown was down by 15 points in the 3rd quarter before they would catch fire. The Eagle’s 2nd half blitz was led by long range shooting from Luke Kelley (20 points) and inside play from Jahbri Hargrove (10 points). Two big 3 point baskets, one each by B.J. Gordon and Richard Bouknight, pulled Norristown within 50-48 in the final minute. But Norristown just ran out of time and Central Dauphin prevailed 52-48. The Rams got good guard play from Brian Laird (10 points), Ryan Beaver and Tyler Napierala who all played a key part, but Norristown had no answer for center Devin Thomas. Thomas totaled 19 points and 10 rebounds and numerous blocked shots by nights end. His two game box score read 51 points, 30 rebounds and 10 blocked shots which was more than enough to claim the tournament MVP award. Coach Crosier discussing the Ram’s defense during a timeout. 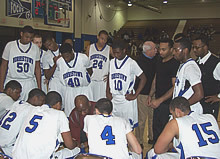 Norristown huddles around coach Evans during the championship game. Devon Thomas was named the 2011 tourney MVP.